Façade of the Alcobaça Monastery. 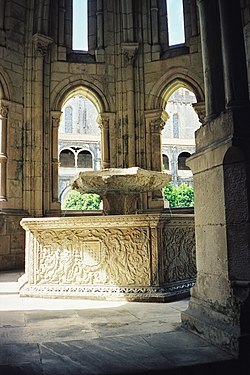 Gothic fountain house and renaissance water basin in the cloister of the Alcobaça Monastery. Alcobaça (Portuguese pronunciation: [aɫkuˈbasɐ]) is a city and a municipality in Oeste Subregion, region Centro in Portugal, formerly included in the Estremadura Province. The city grew along the valleys of the rivers Alcoa and Baça, from which it derives its name. The municipality population in 2011 was 56,693, in an area of 408.14 km². The city proper has a population of 15,800 inhabitants. The city of Alcobaça became notable after the first king of Portugal, Afonso Henriques, decided to build a church to commemorate the Conquest of Santarém from the Moors in 1147. The church later evolved into the Monastery of Alcobaça, one of the most magnificent gothic monuments in the country. In the church are the tombs of Pedro I of Portugal and his murdered mistress Inês de Castro. Over the centuries this monastery played an important role in shaping Portuguese culture. A few kilometers to the north of Alcobaça is the Monastery of Batalha, another gothic building constructed in memory of a different important battle, that of Aljubarrota. To the west of Alcobaça is the fishing village of Nazaré, now a popular resort town. To the south is the city of Caldas da Rainha and the medieval town of Óbidos. Also to the northeast is the town of Porto de Mós with its rebuilt castle. A town that only became notable in the 12th century when it was chosen as the future site of Portugal's largest church. In March 1147, the fledgling King Dom Afonso Henriques, defeated the Moors by capturing the city of Santarém. As a tribute to his victory he vowed to build a magnificent home for the Order of Cistercians. It took another 76 years before this task was completed. The monarchy continued to carry out further construction and 60 years later King Dinis built the main cloister. The Monastery was consecrated in 1262. The church contains the tombs of Pedro I of Portugal and his murdered mistress Inês de Castro and with it the story of the tragic liaison between Pedro and Inês. Forced at an early age as a royal duty, he was to marry Constanza, the Infanta (Princess) of Castile, but died shortly after the marriage. Dom Pedro escape with his true love and later lived in the city of Coimbra. His father, King Afonso IV, believing that the family of Inês was a threat to his own kingdom had her murdered. Shortly after the death of his father Dom Pedro declared that he had married Inês in a prior secret ceremony in Bragança, and promptly took a gruesome revenge on the killers and exhumed her body. He presented the embalmed corpse at the court with a crown on her head and demanded that all his courtiers kneel and individually pay homage to her decomposed hand. Today, their ornate tombs face each other so that on Judgment Day his first sight would be of his beloved Inês. During the following centuries the monks from this monastery had a major influence on the development of Portuguese culture. Notably, in 1269 they were the first to give public lessons to their flock, and later they produced the first authoritative history on Portugal in a series of books. In 1810 the invading French pillaged the Abbey taking with them most of its most important treasures, including the noteworthy library. The items that remained were later stolen in 1834 during an anti-clerical riot and the banning of the religious Orders in Portugal. The main feature of the city is essentially the monastery that proudly presents a long and sombre façade with 18th-century embellishments. This austerity is further emphasized in the cloisters with its apt name of "Cloister of Silence". In contrast within the Abbey is the massive kitchen with a running stream specially diverted to pass through as a supply of fresh water. The open area of the kitchen chimney is large enough to take a whole ox for roasting. The surround to the sacristy doorway is an outstanding example of Manueline decoration. In 1794, Lord Beckford visited the Abbey and commented that he found some 300 monks "living in a very splendid manner"! A few kilometers to the north of Alcobaça is another wondrous building constructed in memory of a different important battle, that of Aljubarrota in 1385, when King John I of Portugal defeated the Castilians and ensuring two hundred years of independence from the Castilian invaders. The construction of the Abbey at Batalha commenced in 1388 and was added to by various Portuguese Kings over these next two centuries. To the east of Batalha is the world-famous location of Fátima and a point of pilgrimage for the Roman Catholic religion due to the vision of the Virgin Mary in 1917 by three young children whilst tending their flock. To the west of Alcobaça is the well-known fishing village of Nazaré. Today, the village is now a small town and a popular holiday resort with most of its past and traditions having rapidly evaporated in the course of time. A very successful Portuguese feature film was made in the early 20th century that dramatically captured the primitive and dangerous life of these fishermen. Stoutly Catholic, the inhabitants have retained some of their past as can be still seen in their own particular style of costume. To the south is Caldas da Rainha and the quaint medieval town of Óbidos that is an attraction for any tourists that enjoys a true glimpse of the past. Also to the south is the town of Porto de Mós with its fanciful rebuilt castle. This town borders the Nature Reserve Parque Natural das Serras de Aire e Candeeiros. These 390 square kilometres of limestone-covered landscape is also known for its underground caverns. The best known being the Grutas de Mira de Aire can be visited and consists of tunnels, caverns with stalactites, stalagmites, lakes, and a music and light finale. Wikivoyage has a travel guide for Alcobaça.